Don’t you worry about Pasqualina! She is just fine, just rehomed. Another goat from Sweden, but no one is about to burn this one down! Probably why he’s smiling. . . .
Save Ava’s Pygmy Goats, Lilly and Juju! It’s time to help out 12-year-old Ava in Federal Way, Washington — animal control wants to take away her caprine friends, and it’s wrong, wrong, wrong in our humble Goat Berries’ opinion. Update from the Goat Pen! It’s been quite a while since I’ve posted here about what is going on in the Goat Berries pen, and there have been some rather large developments, so here we go. Vote 4 Goat – Goat 4 Sale! YOU can help make sure Moose the Doritos-loving goat gets some serious Super Bowl Sunday love by voting for the “Goat 4 Sale” commercial. So go forth, watch the commercial, and vote 4 goat! Check out this hilarious Italian commercial for Golia throat lozenges featuring, you guessed it, a goat! Come add your reason(s) as to how you know you're a goat ma or goat pa or just a goat lover! 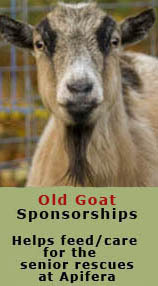 Sponsor the Old Goats of Apifera! Goats that readers have spotted out and about. Send your photos to michelle(at)goatberries(dot)com!